If you bought your first mobile phone in the early-to-mid-2000s, there's a good chance that it was a Nokia and it had the game Snake preinstalled. While mobile gaming has moved on to bigger things, those who still yearn for simple games with a dose of the future can now play a Snake-like in AR via ARSnake for iPhone and iPad. For the youngsters out there, Snake is simple: guide your snake within a square grid towards food, which increases the snake's length, while avoiding the walls or your own tail. The game has enjoyed a revival in recent years as a multiplayer online version of the game called Slither.io (iOS | Android). That smartphone version adds a survival element, where you must also avoid running into other snakes. ARSnake takes the Slither.io aesthetic and adds a third dimension to the gameplay. 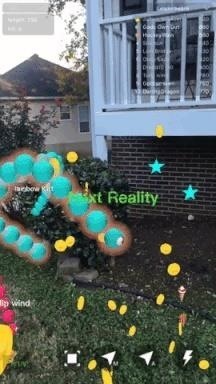 AR ends up being the ideal environment to navigate the game's dynamic. In ARSnake, you swipe left and right to move horizontally, and up and down to dive or ascend the aquarium-like space, collecting coins, stars, and food along the way. Players can opt for manual or auto tracking of their reptilian avatars, with a speed boost available for those who feel the need. While it does require iOS 11, the game doesn't appear to run on ARKit, as it is compatible with older iPhone and iPad models that do not meet the hardware requirements for the platform. This is evident after a few minutes of gameplay, as the AR elements don't anchor to surfaces. Retro gaming seems like easy money, where publishers can appeal to nostalgia among gamers. (I myself have purchased Sonic the Hedgehog and Final Fantasy for multiple operating systems.) For augmented reality, though, the category seems to be an untapped market. Sure, Pokémon GO, with its roots dating back to the Game Boy era, was the first bonafide hit leveraging the technology. But while we've seen demos for games like Super Mario and Tetris in AR, there's not much that retro gaming fans can sink their teeth into at the moment. 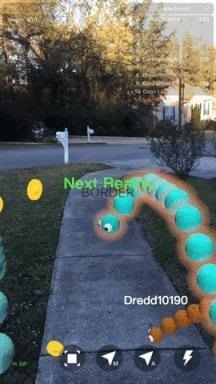 Hopefully, this is the beginning of a cool new (yet old) trend in AR gaming.